Mermaid Tails & Fish Scales, Oh My! 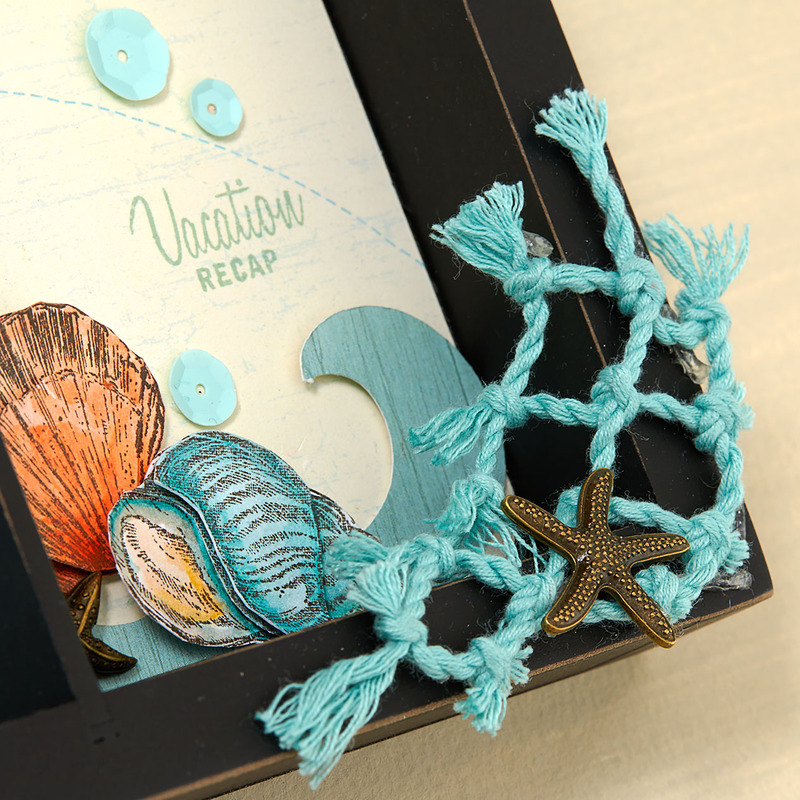 Because we’re sure you’ll have plenty of reasons to scrapbook memories surrounding this trend, including a trip to the beach or a tropical getaway, we want to share with you how to duplicate the fish scale pattern we created in this layout from our Seasonal Expressions catalog. The technique is quite simple, but the end result will be stunning! STEP 1—Consider the space you will be covering up with scales and decide what size circles you want to use. STEP 2—Lay your circles down starting with the top row. STEP 3—Add a second row. You’ll want to attach these circles off-center, covering up the lower half of the circles in the row above. STEP 4—Continue adding all of your rows, one by one. step 5—Trim your edges, and you’re done! Told you it was easy! Now go make some mermaid tails of your own and let us know how they worked out for you in the comments below! As the end of July draws near, some of you have probably started to place your summertime memories in albums. But have you ever thought about hanging them on the wall? 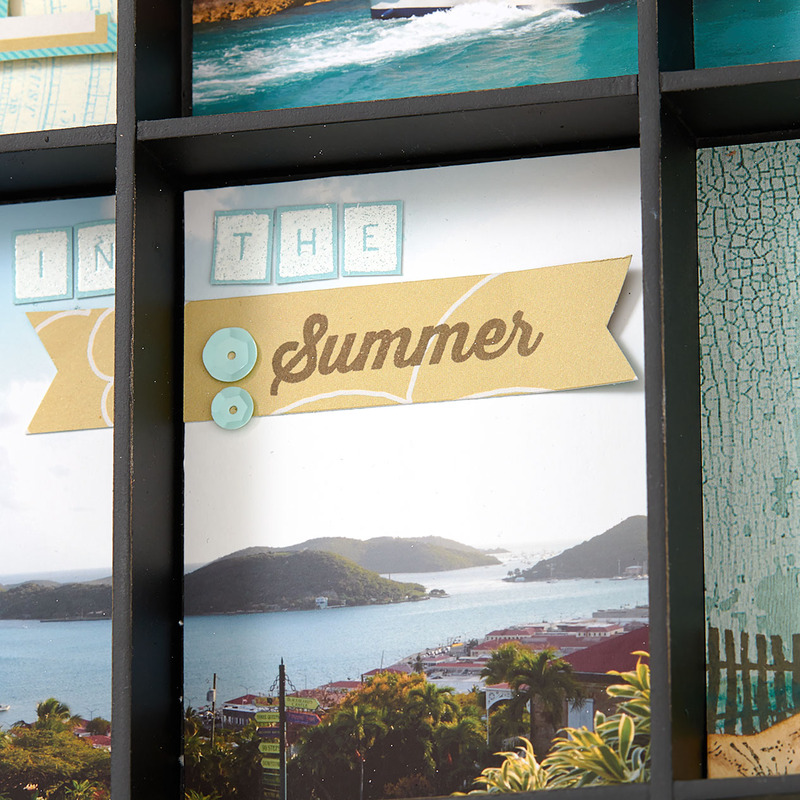 Our Designed Décor products are perfect for preserving memories while still leaving all the creativity to you! 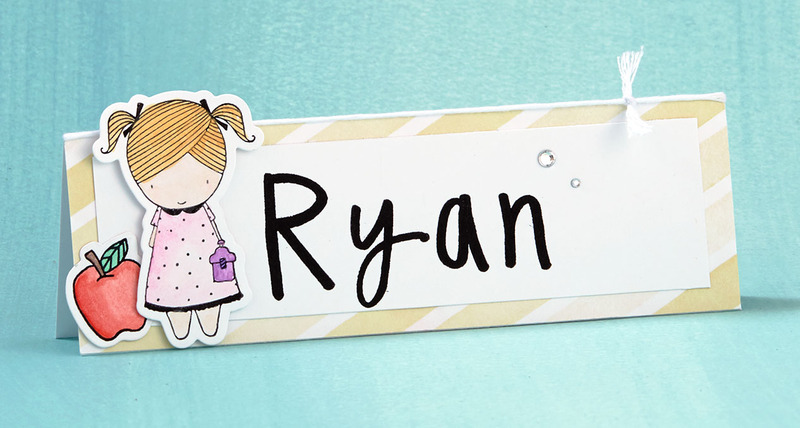 What’s really fun about this line is that the products allow you to showcase your photos while using even more of your favorite paper packets, stamps, and embellishments at once. Of course, the Designed Décor line can also be used with minimal or no embellishments, and the products will still add simple elegance to any photos. That’s what’s great about Designed Décor—YOU get to determine how many details you want to add and the overall effect you want to create. We decided to try our hand at creating a very embellished Designed Décor item, just for fun. 🙂 Our artist started with our display tray, let her creative gears run wild, and produced stunning results! 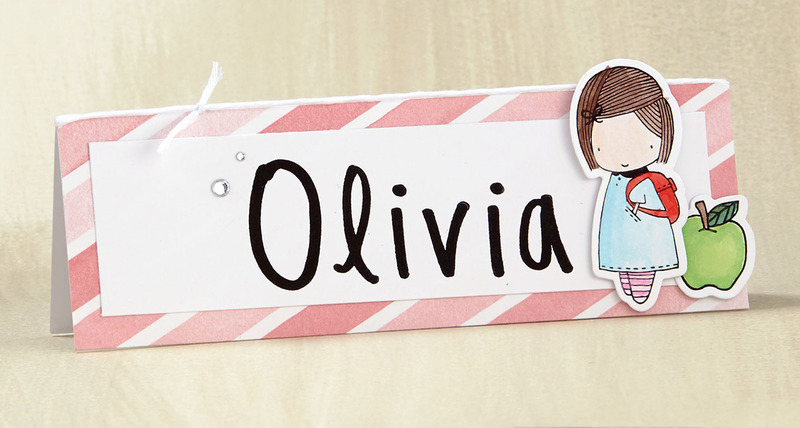 Isn’t that a gorgeous memento to hang on your wall? Right off the bat you can see that our display tray can be a great way to use up leftover scraps and embellishments you have lying around. Our artist cut the “Life” letters from the My Crush® For Her Book and used 3-D foam tape to make them pop. How creative is that? We also love the way the artist cut photos in half to share between two windows. 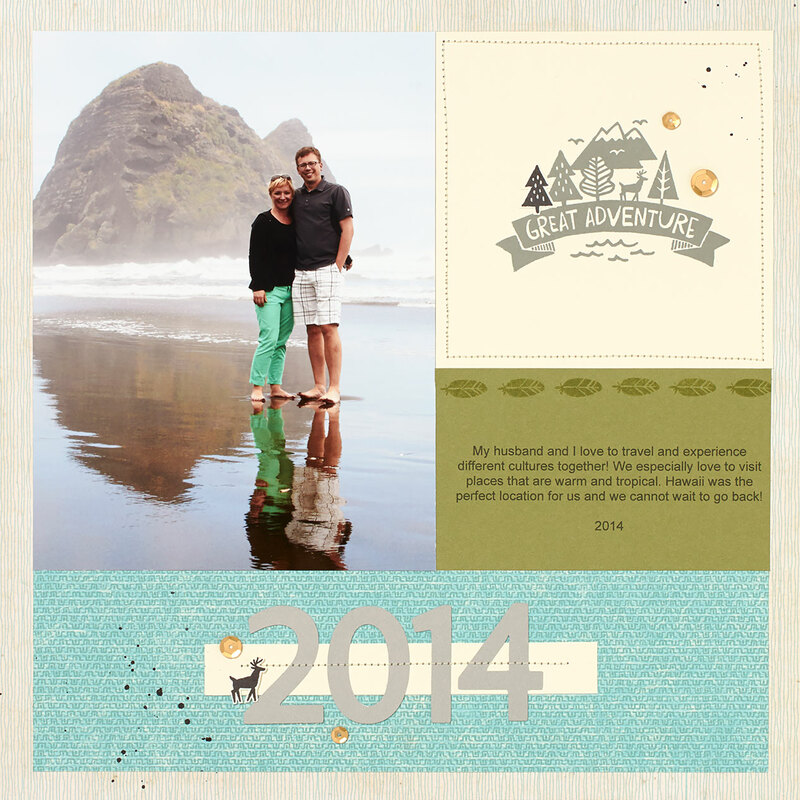 And the journaling on the Picture My Life™ Jackson Scrapbooking Program card. And the landscape scenes created using the Seaside paper packet and fence stamp. Sorry, we’ll try to contain our excitement. This display tray’s just got us reeling! Like an intricate scrapbook page, the small details really make this display tray special. 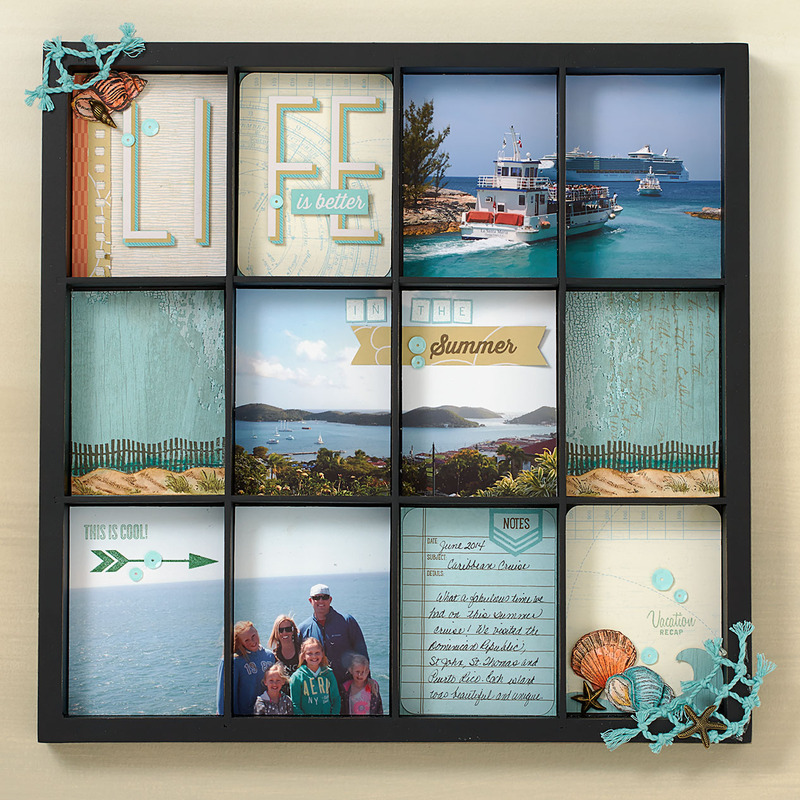 Embossed letters using the My Acrylix® Keyboard Uppercase stamp set provide a gritty texture similar to sand, and what better pictures to use with the Oceanside sequins than actual pictures of the ocean? The sequins tie the cool colors of the display board together wonderfully. Just look at all the details in this corner of the display tray. 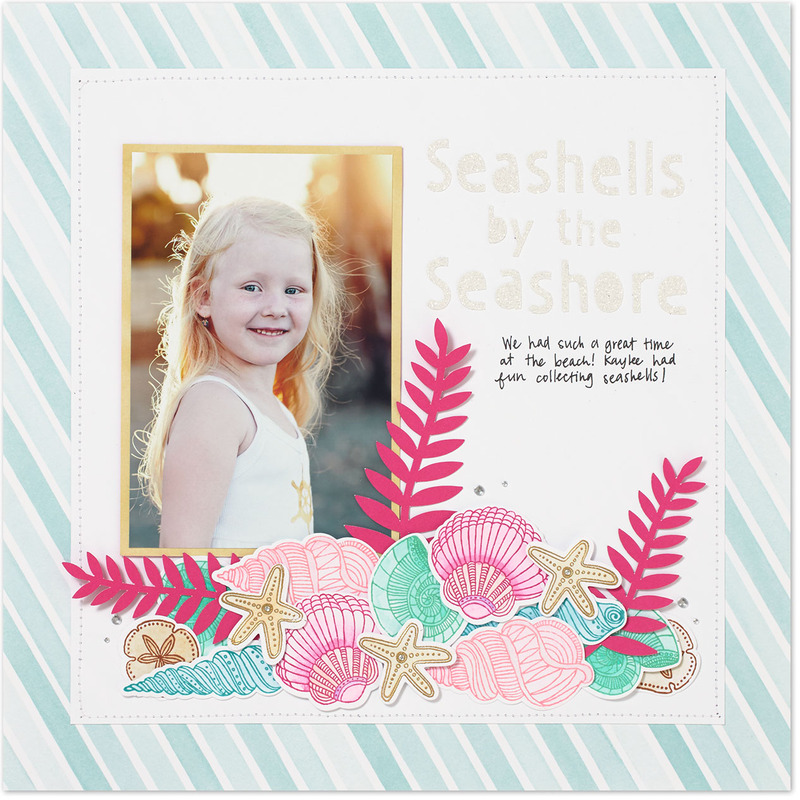 The Cricut®-cut wave, the layered seashells shaded with watercolor pencils, the perfectly placed sequins, the metal Seaside Assortment pieces. And what an inventive way to use Glacier thick twine! The net and starfish add such a unique, dimensional element to this piece. Which summertime diva are you? The sun goddess who can gracefully lounge for hours at the beach? The adventurous mountaineer who proudly wears her bumps and bruises like medals? The barbecuing and sweet-treat baking beauty? The late night “read-everything-in-sight” bookworm? The backyard mama who sumo wrestles her kids to lather on the sunscreen? Whichever describes you, our summer stamp sets will be sure to pair perfectly with your unique summertime memories. How adorable is that? The possibilities are endless! 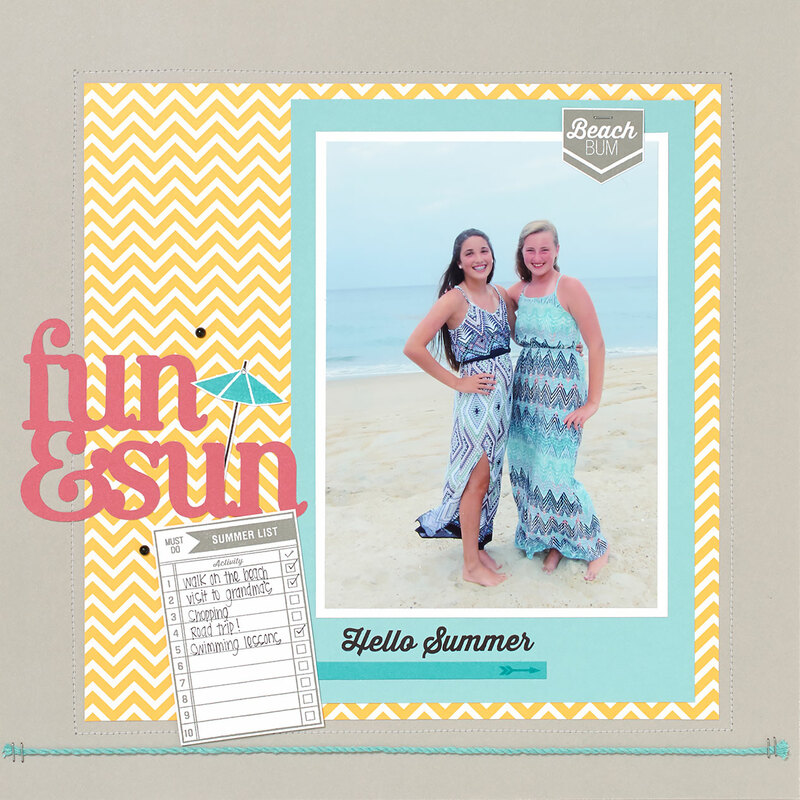 This fun-in-the-sun page also showcases our My Acrylix® Hello Summer stamp set, one of our most versatile summer stamp sets. It’s perfect for beach adventures, vacations, and any sort of fun in the sun. It’d even work great for those days spent indoors when you just have to retreat from the heat. You’ll definitely want to grab these stamp sets to commemorate your summertime fun, and if you do it in July, we’ll sweeten the deal! If you make a qualifying purchase in current, retail priced stamps, like these summertime stamp sets, you’ll get the July Stamp of the Month set FREE! It’s like we’re rewarding you just for enjoying your summer!